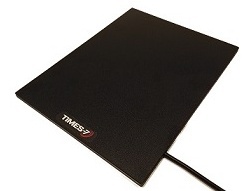 The SlimLine B6031 is an ultra-low profile circularly polarized flat panel antenna for UHF RFID applications in customer facing or space constraints environments, where up to 4 m (13 ft) read range performance is required. Similar in size and weight to a Tablet PC, the B6031 can easily blend into an office or retail environment. Times-7 B6031 Circular Polarized UHF Antenna, SlimLine - Size: 275x214x12(mm), 10.8x8.5x0.5(in), Frequency Range 865 867 MHz EU & UK to ETSI standards, Read Range Up to 4 m / 13 ft.
Times-7 B6031 Circular Polarized UHF Antenna, SlimLine - Size: 275x214x12(mm), 10.8x8.5x0.5(in), FCC Frequency Range 902 928 MHz US Standards, Read Range Up to 4 m / 13 ft.